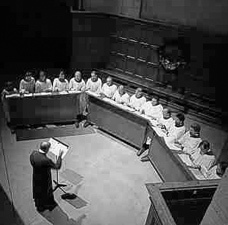 In a darkened Episcopal cathedral in Seattle, Washington, a group of about twenty male voices has been singing Compline every Sunday evening for over forty years. The compline service is the final office in the traditional monastic day. The monks sing Compline before retiring for the night. Begun in 1956 by the group’s founder, Peter R. Hallock, it has become something of a phenomenon, with upwards of 500 people (many in their teens and early twenties) attending the service, and thousands in the radio audience and on the Internet each week. Over the years, members of the group who have left Seattle have started observing the office in their new communities.